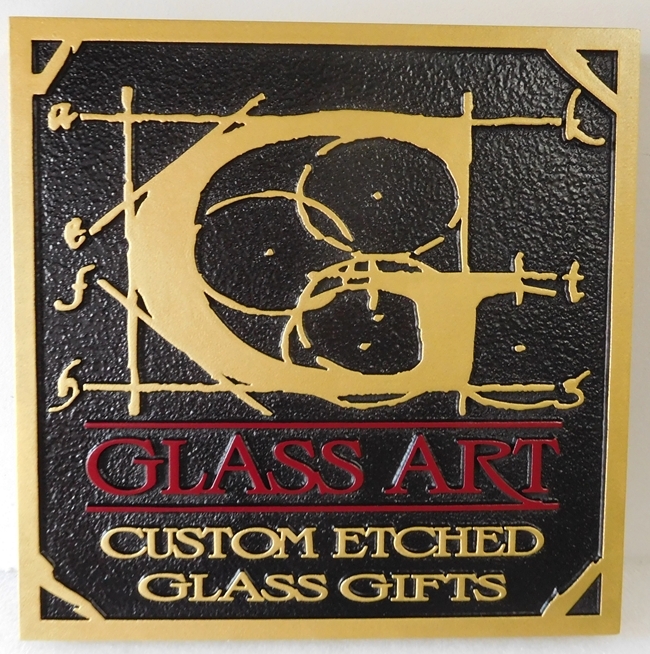 This beautiful and unusual carved 2.5-D HDU sign for the "Glass Art" gift shop has raised text, artwork and border. The artwork, a gold design on etched glass, adds color and brings attention to the sign and studio. The sign has a sandblasted sandstone texture black background.The sign has been painted with long-lasting automotive-grade enamels and clear-coated twice, making it suitable for either indoor or outdoor use. This sign can be mounted on a wall , or hung with chains or links below an overhead beam or a wrought iron hanger/scroll bracket projecting out from a wall or post.